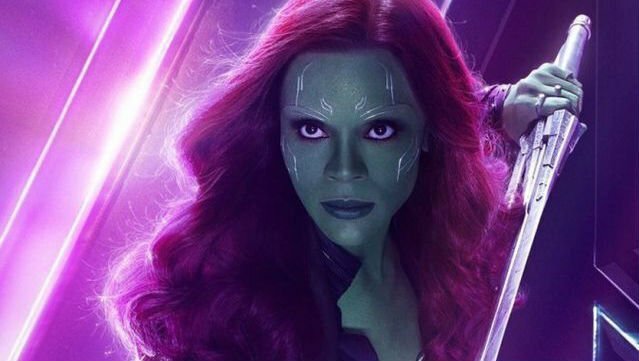 Although her character met a tragic end in this summer’s Avengers: Infinity War, Zoe Saldana is teasing Gamora’s return to the MCU. The actress took to Instagram today to post a photo of herself in the makeup chair for the Avengers 4 reshoots currently underway in Atlanta. She also shared two videos to her Instagram story, once of which features her humorously dancing to the song “Bloody Mother F***ing A**hole” by Martha Wainwright. In Avengers: Infinity War, Gamora was sacrificed by her adoptive father, Thanos, on the planet Vormir in order for the Mad Titan to obtain the Soul Stone. It isn’t clear if the character will actually be resurrected in Avengers 4 or if she’ll only be appearing in the Soul World and/or in flashback scenes. It’s also worth mentioning that in Marvel’s current Infinity Wars crossover event, Gamora assembles the Infinity Stones herself and takes on the persona of Requiem. So it’s possible that the filmmakers could go that route as well. Whatever they’re planning, Gamora’s return should not come as a big surprise. In the original Infinity Gauntlet comic, most of the deaths that took place–whether they were caused by Thanos’ snap or otherwise–were reversed by the storyline’s end. Saldana is also contracted to appear as Gamora in Guardians of the Galaxy Vol. 3, but that film was put on indefinite hold by Marvel Studios following director James Gunn’s firing back in July. Saldana isn’t the only actor who’s recently been seen on the Avengers 4 set despite their character appearing to die in the last film. Screen Rant reports that Tom Holland was recently spotted on a flight from Atlanta to New York just a few days ago. Again, this isn’t surprising since Holland’s Spider-Man: Far From Home will be releasing a just a few months after Avengers 4 on July 5, 2019. The as-yet-untitled Avengers 4 hits theaters on May 3. How do think the film will bring back Gamora? Share your theories in the comment section below!